I was born in Radcliffe, Lancashire in 1943, in the midst of the Textile and Cotton Spinning and Weaving industries. This influenced my decision to study Textiles and Wood at Bishop Otter College, Chichester with Jeff Lowe and Dimelo Middleton. From 1964 until 1972 I taught in Primary Education in Berkshire and was a Deputy Head when I was appointed Senior Lecturer at St Hild’s College, Durham and went on to become a Lecturer in the School of Education at the University of Durham. During these years I continued to explore and develop my textiles, designing and building spinning and weaving equipment, always with the thought of having his own weaving studio. I explored and experimented with the woven structure within the Contemporary textiles of the 1960’s and 1970’s. In 1976 I studied Tapestry Weaving in the South of France and the next year 1977 established the Weaving Studio and Gallery in the High Pennines in the village of Ireshopeburn, Weardale, Co Durham I continued teaching until 1982 when I resigned from the University of Durham to work full time on Textiles. Since the 1960’s, as an experienced teacher and textile artist, I have given lectures and conducted workshops for the Guilds of Spinners, Dyers and Weavers and the Embroiderers Guilds throughout Britain and taught on residential courses at West Dean, Chichester, Farnham, Urchfont Manor and Attingham Park. I exhibited regularly throughout Britain and abroad since 1964 in group and one-man shows. My major travelling solo exhibitions totalling 27 include the DLI, Museum and Arts Centre, Durham, Leeds, Reading, Durham and Sussex Universities, Quarry Bank Mill, Styal, Bedes World, Jarrow, Stranraer, Braintree, Tubingen, Germany, Wakefield and Doncaster Art Galleries and Lancaster. After 26 years of running the “Weavers Studio and Gallery” in Ireshopeburn, Weardale, County Durham, I returned to my roots in Lancashire in July 2003 and now live in Heysham on Morecambe Bay. I continue my research into the Design Process and to Designing and Weaving Tapestries, spending more time with my watercolours and exploring the wider world of writing and creativity. Travels in India, Nepal, America, Europe, Africa and Namibia has given me more thought to the re-occurring themes of movement and of past, present and future time, of life and death, of man and his environment and his relationship to the boundaries of the physical and spiritual worlds. 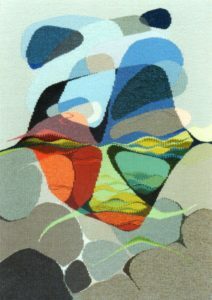 My name is Michael Crompton and I have been a Textile Artist since the early 1960’s. I was born in 1943 in the industrial town of Radcliffe, just north of Manchester. Like so many of my contemporaries I was expected to find a job in one of the many factories and mills within the area. My grandmother started working in a mill at the age of about twelve, around 1900, sweeping and cleaning under the working cotton looms. As she grew she graduated to a bobbin winder and finally to a loom minder and worked up to six looms at the same time. When she heard that I was thinking of finding a job in a mill she summoned me and told of the many dangers and hazards of such places. She was stone deaf from the noise of the machinery, the continuous drive belts of the Lancashire Looms, the recalcitrant flying shuttles which would shoot up through the warps and of the air filled with cotton fibres all were a real danger and must be considered most seriously. For all this I was fascinated by the “dark satanic” mills, larges edifies, a source of great heat, of steam and smoke billowing from the chimney, and the ant like trails of workers entering and leaving at the beckoning of the factory hooter. This was my playground and where I spent my childhood. It was here that I found discarded yarns, bobbins, and strings, old bits and pieces from looms and textile machinery and I soon became absorbed by knotting, embroidery and weaving. Just as I was about to leave school I was introduced to the world of the “Arts and Crafts” movement, of William Morris and his ilk. Here was an alternative to the Mill system that of the country workshop using local materials and making products by hand for the local population. I had found my pathway and one which I still travel. I was fortunate to find Bishop Otter College, Chichester where I could take a teaching qualification and also study textiles and wood. This was a glorious and stimulating experience for the college environment was rich in original works of art by many important makers of the twentieth century. 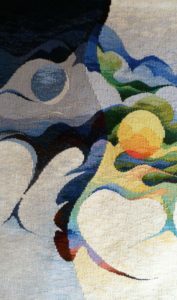 Many wonderful two and three dimensional pieces by Roault, John Bratby, Stanley Spencer, Ivon Hitchens, Henry Moore and an exquisite tapestry by Jean Lurcat which was hung in the New Chapel. I left Bishop Otter with a loom and Mary, my future wife and whilst following a teaching career I continued to weave tweed fabrics, rugs and decorative hangings. In 1972 we moved from Berkshire and the primary education scene to St Hild’s College, Durham where I was a Senior Lecturer in Textiles and Design, eventually moving to the School of Education, University of Durham. In the mid 1970’s I realised that my pathway was leading to spending all my time with my textiles and weaving. In 1977 we moved to the old blacksmiths cottage in the Upper Weardale village of Ireshopeburn high in the Northern Pennines of County Durham, finally resigning from the University in 1982 to follow my textile career. There in the forge we set up our looms and welcomed interested visitors who experienced a country craft workshop. It was only natural that the environment played a large part in my creative thought processes. 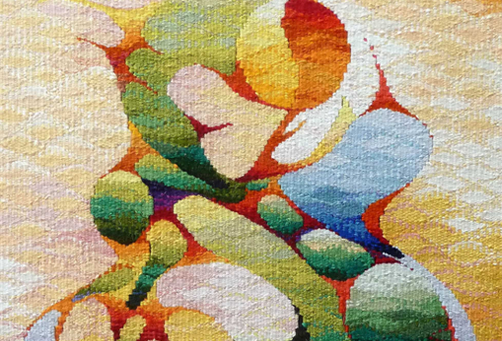 The forms and shapes, colours and hues were ever changing throughout the year, the sights and sounds, the aromas of new mown hay and early spring growth all found their way into my textiles. Conscious that I was mainly part of a mechanical process of weaving on a four shaft floor loom I became more and more interested in the field of tapestry weaving. For me this was an important development. I could have taken a course at an Art School or similar but chose another route and a very different experience. Being involved with teaching and teachers I felt that I did not want to be “taught” by a teacher. Instead I located a practising tapestry weaver in Province in Southern France, Daniel Drouin, and I spent some time there assimilating from the rich learning environment of a Tapestry Studio. Yes, I learnt a great deal but the most important aspect was the whole approach to the ways of designing and weaving. 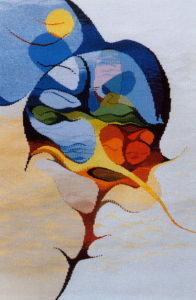 Tapestry is an amalgam of the thinking Artist and the Craftsman Weaver. Before weaving can start I have to an image, which means that concepts, ideas and thoughts must be explored. This pathway is long and my philosophy is continuing to progress and mature. I use simple vertical frame looms with pegs top and bottom and these allow me to increase or decrease the number of threads in the warp. Having made looms all my life I have found that gradually I have simplified them to the basic rectangular shape without any shedding devices and using a continuous warping method there is no need for a sophisticated tension device. I prefer to use a France style tapestry bobbin which is both a placer/beater and acts as a reservoir for my yarns. Finger shedding is not the slow process I once thought. As a beater I prefer a four prong fork, silver preferred but stainless or EPNS are fine, as the tines can be bent for each particular warp. The yarns I use are two and three ply rug yarns with a high percentage of wool, (90% Wool & 10% Manmade), and are chemically dyed and moth resistant. Working with two strands I can accommodate colour matches. In all my work I concentrate on the curved line. A curve line denotes movement and hence time. My themes and concepts often revolve around past time, present time and future time and include the transitions from one season to another, and the cycles of both the Sun and the Moon. Perhaps the most influential aspect is the link between the physical world and the spiritual world. I describe this as the “tingle zone”, that primary experience that sends shivers down the spine or bombards the mind with emotion. Whether it is the cool vastness of a great Cathedral, or the sight of the high peaks in the Himalayas, or the emptiness of the Namibian deserts help to recall sensory memories and special feelings. This is fundamental to my ways of working. I have never thought about starting and ending, always concentrating on a developing and evolving my “process”. I look at how other artist and makers go about their approach, I read widely around subjects and listen to music, and attempt to make a visual interpretation of sound. To find a resonance between ideas and a design or cartoon occupies my thinking. Just as Jean Giono, the French author said: “The days are round”, so my thinking is always ongoing. I make collections of natural objects, of eroded stones and driftwood, seed heads and anything which contains colours, textures and forms all to aid me in the exploration of an idea. Using coloured yarns I wrap selected colours around a piece of card to recreate the colours in the environment. Thus helping me to understand how one colour reacts with its neighbour. My sketch books contain not just drawings, but my own writings, prose poetry and observations, quotations and anything that may make a contribution. I capture and identify forms, then analyse and synthesise component parts, aiming for a simplification yet capturing the essence. These books are referred to months and even years later for they may be seen as an adjunct to a vocabulary. I have found this approach to be vital especially when travelling and when I am away from my studio. 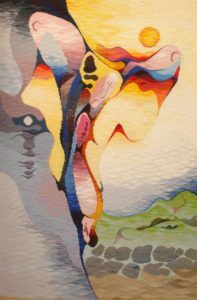 I draw and use watercolours to explore my ideas and concepts. If I am following a theme I may well make six, ten or even more water colours. Often other ideas are created and I allow myself to follow. The decision to take an idea into tapestry is never rushed. While investigating a theme I often find that I have arrived at a point that a tapestry beckons. I consider now that ideas and a defined design find me. I no longer need to search for them in my head for now it is my heart that dictates. By concentrating on the process rather than an end product my concepts and perceptions are enhanced. I am able to meander off a given path and to discover new aspects, to remember past encounters and take these into future. Having been a country workshop since 1977 we moved across the Pennines to the Morecambe Bay area in 2002. Without the need to continue as a business I am able to concentrate much more on my enthusiasm for woven textiles. I would encourage any textile artist, or indeed anyone, to read this and to think how it can influence the thinking of a creative person. Two artists whom I have looked to are Edvard Munch, the Norwegian impressionist and Paul Gauguin the Post-Impressionist. Both worked in a style, a form of “cloisonné”, where they identified specific shaped areas then added colour. This is similar to my work where individual areas are conceived and interpreted as separate yet part of the whole and all with a contemporary manner. 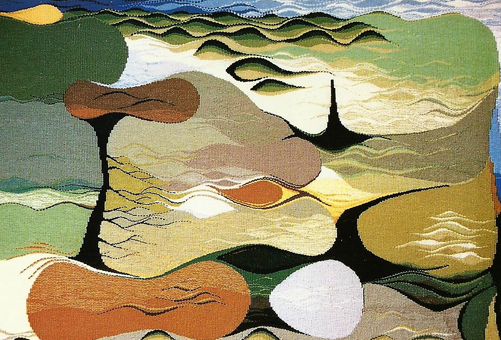 I see landscape as a series of interlocking shapes. Writings for Tapestry Images. All high warp tapestries. Le Carrefour – The Crossroads. Looking Back to the Future. It was whilst flying over the North Pole to California that I looked out of the aircraft window on the right hand side and saw the Sun and Day. Moving across the aisle to the other side windows the view was of the Moon and Night. From this initial experience I was fascinated by being able to see two different times, so different that I was unsure whether it was day or night. By incorporating both images in one and using the curved line to express both time and movement. 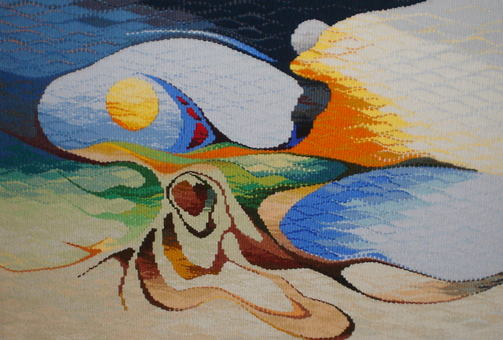 I have in later tapestries included the juxtaposition of both the Sun and Moon in their differing shapes and positions to challenge the viewer. During the previous months I felt I had reached a point in my weaving unsure as to how to proceed. Whilst I had been drawing and reading, gathering colour combinations and reviewing recent work I saw little to indicate how I was to move forward. Gradually, over a period of time, my thoughts began to materialise. I was at a crossroads uncertain whether to move forward or to look back at previous sources, or to move to the left or to the right. This movement, whichever way I was to go, should be included in the chosen design. It should also reflect the landscape of Weardale and its environs. Looking back suggested that the four chambers of the heart along with the four elements could play a part. The selected design includes the characteristic dry stone walls of the North Pennines. I always look over them in some way to see over and beyond. This scene, of fields and fells, often with a changing light emphasising the natural world. I have included a pathway up towards the top of the fell typifying man’s aim of reaching for the summit, whatever that might be. On the left is the shape of a foot as man moves through life and towards the unknown. The four chambers of the heart give structure to the colours of the four elements, red for fire, greens for earth, blues for water and light blues for air. Over and through the dry stone walls are arcing, stretching limbs, once again epitomising man’s journey, and mine. The clouds overlap and over laid set in a darker background with the light concentrated on the centre of the crossroads. I have now found out just where I am and can look forward with the confidence this tapestry has given me. “I am at a personal crossroads. How do I decide which direction to take? How will past experiences help my decisions? A return – to what? Is very idiosyncratic as its design is predominantly based on our life and the shapes, colours and textures of the Northern Pennines. Gone are the stone walls, the interlocking shapes of valleys, dales and gorges. Movement is more pronounced, the verticals giving the line of life’s journey with a hint of plant growth. The light background so redolent of the “known” and with only restricted areas of the dark, the “unknown”, are included. The four elements are present as are the four chambers of the heart all this within the outline of the side view of the human head facing fright. My aim was to extend this thinking far beyond the confines of the Dale for the concepts are universal. 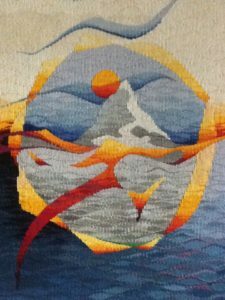 This tapestry is one of a series of four and is concerned with the close relationship between the physical world and the spiritual world of the people of Nepal and the Himalayas. Having visited this area on a number of occasions the impact it has made upon me is considerable. The environment of the “High Places”, the Himalayas plays an important role in the lives of the people. This design attempts to show the link between the hard landscape and their spiritual beliefs. A human figure formed from eroded rock, sturdy and robust placed beneath the high peaks where ordinary people cannot reach. These peaks seem to belong to another world and the religious belief is where the gods live. The colour yellow and golds represent this, they are symbolic of enlightenment and religious belief. The journey to “enlightenment” is both long and arduous taking a whole life span. It may be that it is unattainable but it is the journey which is so important. This single free standing Oak is symbolic of longevity having survived for centuries, it has witnessed countless cycles and changes of seasons. The typical shape of its leaf has been incorporated into its overall shape and in the roots. This echoes the annual transition when the leaves fall to the ground in autumn, and over the winter and early spring turn into rich compost to give back nourishment and strength, new growth and hope for the future. The Tapestry was woven during the millennium year and I chose to make much of the old and the new: a fresh beginning hence the moonlight giving way to dawn. From the base of the ancient trunk and arising from the horizon a burst of light signifies a new dawn and a new day. “Stanhope Tapestry” “The Struggle for Life”. St.Thomas Parish Church. Stanhope. Co Durham. Weardale is a special place. The people who live, work and play out their lives amid the beauty and harshness of the Northern Pennines know only too well the problems and opportunities that exist along the banks of the River Wear. Those who worked the lead mines and the land are accustomed to the “Struggles of Life”. The seasons whenever they occur can be harsh and severe, welcoming and accommodating, yet always bring their own picture of natural beauty. Having spent many years in the Dale working and bringing up a family I have included many of my thoughts and feelings for this place in the design for a tapestry. The basic form of a figure has its origins in a piece of natural wood and a remarkable rock structure. It has seemed to me that whenever and wherever I am in the area I am always looking over dry stone walls. While the early dawn and dusk are evocative periods of the day, the night especially with a full moon has its own attraction. This encompasses the unknown of the dark to the known of the day. The horizons of the fells go on forever, the skies ever changing and the reflections all add up to create a special atmosphere. The vast array of colours and textures also make their contribution. All this adds up to a place where the physical world meets the spiritual world. This for me represents a “tingle zone”. A figure representing a struggle is positioned astride the night and the day, the unknown and the known and the spiritual and the physical worlds also incorporate the feeling of a renewal, a rebirth, it has echoes of the crucifixion. It is the people in the community who make the Dale with their warmth and enthusiasm, their fortitude and zest for life and living. 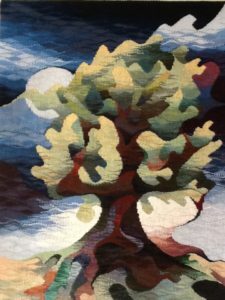 It is for these that this tapestry is dedicated as a celebration and a commemoration for all who live their lives in the splendour of Weardale.